What does the word “ramen” mean to you? Unfortunately, for 95% of American diners, “ramen” means those 5-for-a-dollar cheap noodle packages at the grocery store. That’s really, really unfortunate, since true, fresh ramen noodles are a classic example of good Japanese food, and they are serve as a wonderful foundation for ramen soup. Unfortunately, outside of California, there aren’t many good ramen shops out there. One notable exception to this I’ve found is Matsu Chan in Canton, MI. Having been in existence well over 15 years, Matsu Chan is nestled into a small storefront in one of those mostly-vacant strip malls you see all over the Detroit area, and has a very humble storefront. 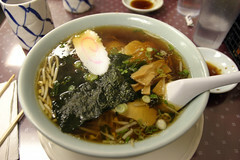 However, once you pass through the doors, Matsu Chan is pure ramen shop. About 1/3rd of the floor space is taken up by the kitchen area, with a large counter where the staff assembled the noodle bowls, appetizers, and other dishes. The rest of the place is tightly packed with tables. Specials are available, and are handwritten on paper on the wall. Despite the many possible variants, I opted to keep it simple: dumplings, fried rice, and shoyu ramen soup. My shoyu ramen (upper right), was a very well done ramen noodle soup, with pork, seaweed, and kamaboko added for flavor in a very rich shoyu broth. The noodles were soft but toothsome, and the seaweed and pork rounded out the soup very nicely, resulting in one of the best noodle bowls I’ve ever had. However, the two side dishes are certainly worthy of mention as well. The dumplings were perfectly seared little pockets of pork, ginger, and garlic that just exploded in flavor in your mouth. 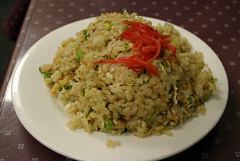 Similarly, while fried rice is usually a pretty modest side-dish heavily laden with soy suace, I found the fried rice here to be a pleasant exception to that rule: with the perfect blend of crunchiness, starchiness, and flavor (rich notes of ginger, garlic, and sesame). Overall, I was thoroughly pleased with my dinner from Matsu Chan. It was very flavorful and authentic, while also being quite informal and affordable. This is an excellent food review. I worked in Canton MI for 8 years and used to eat at Matsu Chan almost twice a week for lunch. This is an excellent restaurant with an extremely friendly staff that treats customers like family. Everyone should try the Curry Ramen dish which is out of this world. This place is also the most consistent restaurant I've eaten at. In all my time there, I never had a meal taste, look, or smell differently than it did when I first started eating here. I have yet to bring someone here that didn't love it. This is in my top 10 restaurants of all time which is relative to me (of course!). (Closed) Recently, the Rusty Moose restaurant in Grantham, NH closed, and after several weeks of vacancy, it has reopened as the Grantham Cafe, open for breakfast and lunch 6 days a week (closed Mondays). The owner of the cafe also owns Grantham Video down the way, so the new incarnation of this restaurant sports a Hollywood motif, with movie posters, some film reels on the wall, and most of the menu items named after movies (mine was named after McGuffin, for example).